HAVANA: The Rolling Stones rocked Havana on Friday at the most lavish concert ever in communist Cuba, where such music was once banned. Tens of thousands of cheering fans crammed into the Ciudad Deportiva sports complex in the Cuban capital to hear the British superstars, playing on an 80-meter (260-foot) stage flanked by 10 giant video screens. 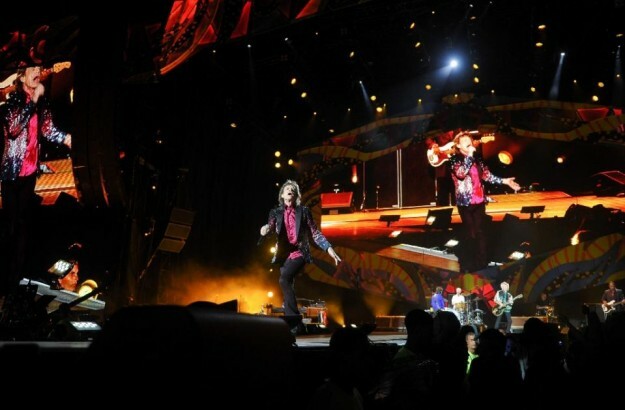 Stones frontman Mick Jagger, wearing a colorful sequined jacket over a burgundy shirt, kicked off the show at 8:35 pm local time (0035 GMT) with Jumpin’ Jack Flash, followed by It’s Only Rock ‘n Roll. The crowd included older couples, families, tourists and plenty of young people. Thousands packed the surrounding streets near the city center, while neighbourhood residents piled onto rooftops to take in the scene and the music, which could be clearly heard more than half a mile (one kilometer) away. 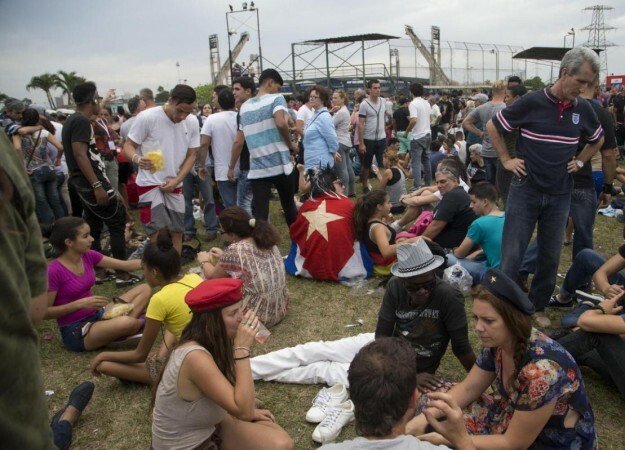 With no charge for entry, Cuban state media estimated that as many as 500,000 people could gather. Some had slept out overnight to get the best positions. Many others began streaming in more than six hours before the concert’s start. “We didn’t manage to be the first, but from this spot we’re sure not to miss a single detail,” said Stones fan Swnien Morera, 27. Police were out in force and an alcohol ban was in place. Many said the event showed Cuba was finally coming out of the cold after decades of ideological and economic isolation. 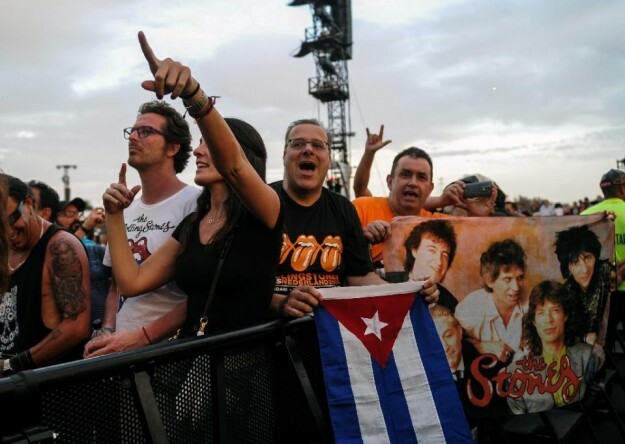 ”I think I’m going to cry,” said Miguel Garcia, 62, who had come by bus from Cienfuegos in the south of Cuba and slept on the sports field ahead of the show. Jagger, 72, Keith Richards, 72, Charlie Watts, 74, and Ronnie Wood, 68, flew in late Thursday, arriving just two days after a political superstar, US President Barack Obama, ended his historic visit aimed at overcoming more than half a century of US-Cuban hostility. The twin events added up to a tumultuous week for Cuba, which has been run by Fidel Castro and now his brother Raul at the head of the Communist Party ever since their guerrilla army drove out a US-backed regime in 1959. Between the 1960s and 1990s, rock ‘n roll was discouraged to varying degrees, leading during the most repressive years to clandestine listening sessions and an underground trade in smuggled recordings. “A Rolling Stones concert in Havana? It’s a dream,” said Eddie Escobar, 45, who founded one of Havana’s few clubs for live rock music, the Yellow Submarine. He remembers secretly searching for US commercial radio frequencies so that he could hear the Stones, Led Zeppelin, Deep Purple and the like. “Rock music, I hope, will open everything else — politics, the economy, the Internet. We’re 20 years behind absolutely everything,” Escobar said. With no tickets on sale, it was impossible to confirm local and music industry media estimates that between half a million and a million people would come. 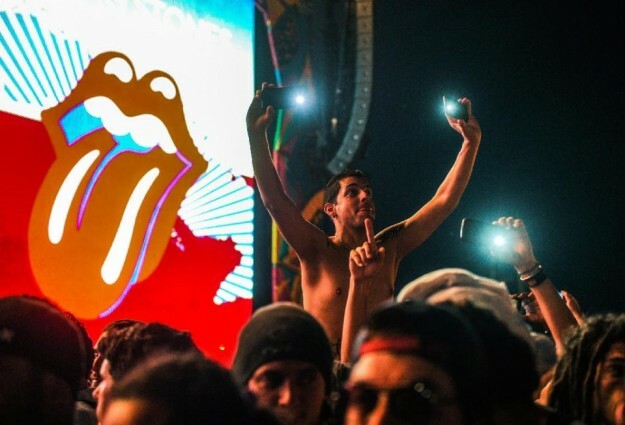 What was sure was that the Stones staged the most grandiose show ever staged in Cuba, where no other comparable rock group has come to play — put off by a lack of infrastructure and Cubans’ lack of spending power. Organizers told Billboard that the high-tech production meant importing gear in 61 sea containers and a packed Boeing 747. The Cuban contribution to the technical side of the concert was decidedly lower-key. 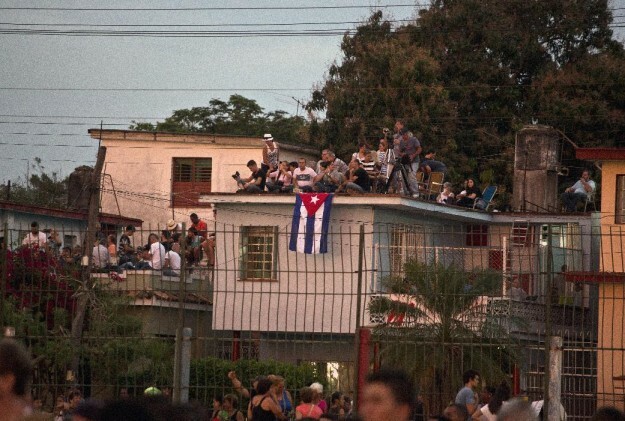 As nearly everywhere else in Cuba, there was no wi-fi signal at the sports complex, and as the crowds grew cellphones became unreliable. Cabins built over drains served as public toilets. The band called on fans via Twitter to vote for one of four songs — Get Off My Cloud, All Down the Line, She’s So Cold, and You Got Me Rocking — to be included on the playlist. But few in Cuba, where Internet is not widely available, have access to Twitter. Previous Previous post: Islamic State second-in-command likely killed: U.S.